1 CIRAD, UMR PVBMT, 97410, St Pierre, La Réunion, France. Pseudocercospora fijiensis, the causal agent of black Sigatoka disease of banana (Musa spp.) (BLSD), is considered to be the major economic threat for banana cultivated for export (de Lapeyre de Bellaire et al., 2010). The disease has a worldwide distribution throughout the humid tropical regions and has been previously reported in the southwest Indian Ocean area: in 1993 in Mayotte and Comoros islands (Jones & Mourichon, 1993), in Mauritius in 1996 (Soomary & Benimadhu, 1997) and in Madagascar in 2000 (Jones, 2003). In December 2017, typical BLSD symptoms were observed in a Cavendish cv. Petite Naine crop located in Grand Etang municipality, St. Benoit (Site S1, Fig. 1) in the east-central area of Reunion Island. Typical early symptoms (stage 2) were 1-4 mm long brown streaks on the abaxial leaf surface, and typical older streaks (stages 3 and 4) were also observed (Figs. 2-3). In March 2018, banana leaves bearing leaf spot symptoms were collected in the four following sites (Fig. 1): Grand Etang (S1), where potential BLSD symptoms were observed in December 2017, and Piton St Rose (S2), Anse des Cascades (S3) and Langevin (S4). At each site, four leaf fragments (A, B, C & D) cut from different banana plants were sampled resulting in 16 distinct samples. All leaf fragments were sent to the ANSES laboratory where molecular diagnostics was performed following the protocol developed by Arzanlou et al. (2007). Genomic DNA was extracted from ground leaf fragments displaying symptoms using the DNeasy Plant Mini Kit (Qiagen, Germany). 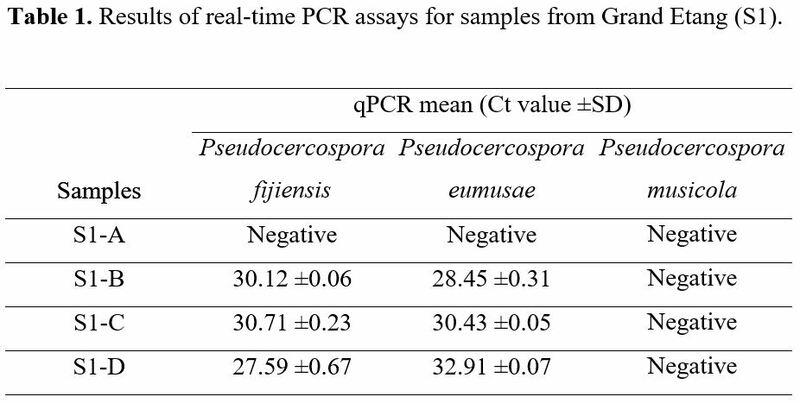 The DNA extracts were used as templates for a real-time PCR assay designed to specifically detect the presence of P. fijiensis DNA. 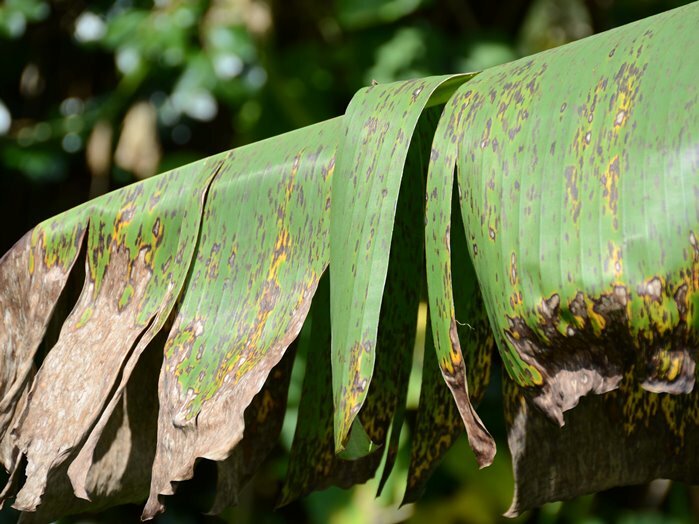 The presence of DNA from Pseudocerspora eumusae and P. musicola, two related ascomycetous fungi causing other banana leaf spot diseases, were also assessed using the protocol of Arzanlou et al. (2007). Both positive and negative controls were included in the assay and every sample reaction was duplicated. 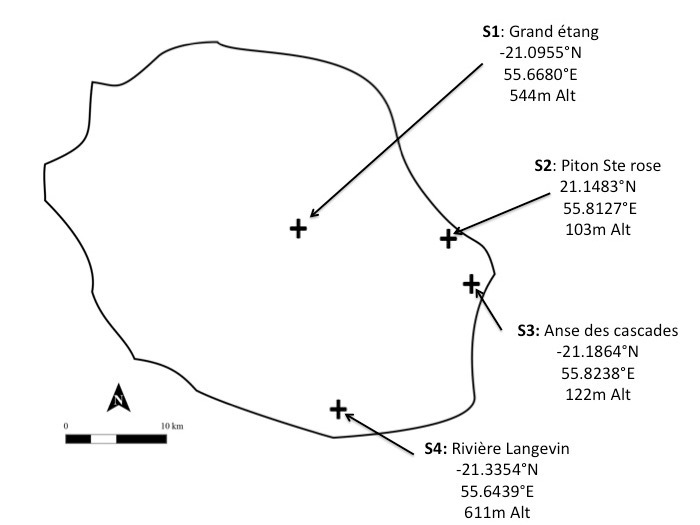 Pseudocerspora fijiensis was detected in three of the four samples from Grand Etang (site S1, see Table 1). The three positive PCR products were sequenced and deposited in GenBank (Accession Nos. MK729105- MK729107). No positive signal for P. fijiensis was found in the other three sites. To our knowledge, this is the first report of BLSD in Reunion Island. Interestingly, our results also showed co-infection with P. eumusae (Table 1). This observation is in accordance with the literature since P. eumusae, the fungus causing eumusae leaf spot disease was identified on Reunion Island in 2000 (Jones, 2003). Further investigation will be required to monitor the spread of BLSD on the island and to identify the origin of the populations responsible for the introduction of the disease from the first reports of BLSD in the southwest Indian Ocean area in the 1990's. Figure 1: Geographical distribution of the four sampling sites on Reunion Island and their associated latitude, longitude and altitude. Figure 2: Typical symptoms of black Sigatoka disease observed on a Cavendish cv. Petite Naine crop located in Grand Etang municipality (Site S1-B). Figure 3: Magnified symptoms of black Sigatoka disease observed on a Cavendish cv. Petite Naine crop located in Grand Etang municipality (Site S1-B). Jones DR, Mourichon X, 1993. Black leaf streak/black sigatoka disease. Musa Disease Fact Sheet, International Network for the Improvement of Banana and Plantain. de Lapeyre de Bellaire L, Fouré E, Abadie C, Carlier J, 2010. 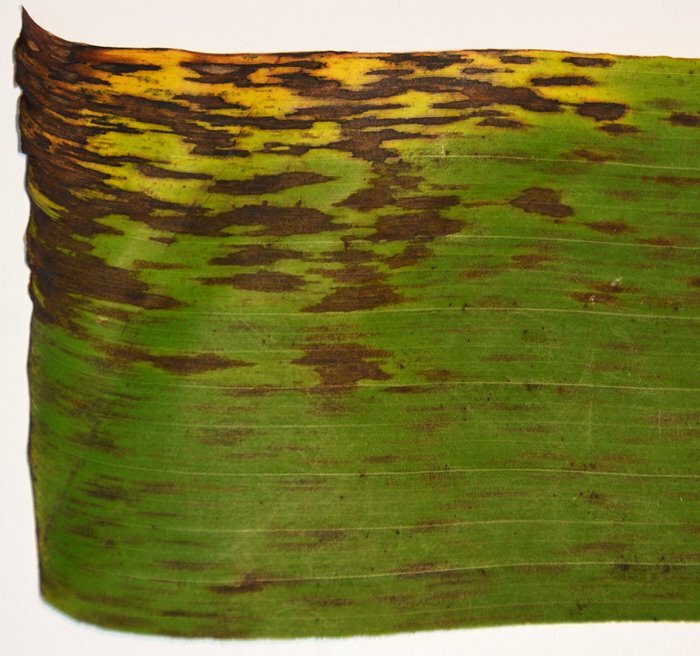 Black Leaf Streak Disease is challenging the banana industry. Fruits 65, 327-342. Soomary S, Benimadhu SP, 1998. The Mycosphaerella leaf disease complex (MLDC) of banana in Mauritius. In Lalouette JA, Bachraz DY, Sukurdeep N, Seebaluck BD, eds. Proceedings of the Second Annual Meeting of Agricultural Scientists, 1997, Reduit, Mauritius. http://farc.govmu.org/English/Documents/Policy%20and%20promotion/Publications/finalm97.pdf. Accessed 14 December 2018.